See that black part on the bottom of the crock pot? Do you know it melts if it sits on a lit burner? It was an accident. I was cleaning the counters and moved the crock pot to the top of the stove to clean underneath it, as I had made lamb curry in it the night before. As I pushed the crock pot to the back corner of the stove, one of handles must have knocked one of the knobs to High, and the next thing I knew I was smelling something burning. And that something was the bottom of the crock pot melting all over the stove! Good thing it was easy enough to clean up...the plastic lifted right off the stove once it had cooled down. 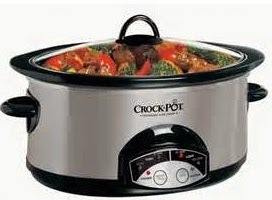 So now I'm on the hunt for another crock pot...any recommendations since it's been awhile since I've bought one?